"Thanks to the people of Nairn and Nairnshire for completing the surveys thus far. After review, the following topics feature as being important to the people of Nairn and Nairnshire - Transport, Employment and Training, Places and Spaces. In the future, there will be a final report on the consultation and this will be available on the website http://www.highlandcpp.org.uk There will be a meeting held in public on 14 August 2017 at 1800 hours when the various Transport related issues will be discussed. 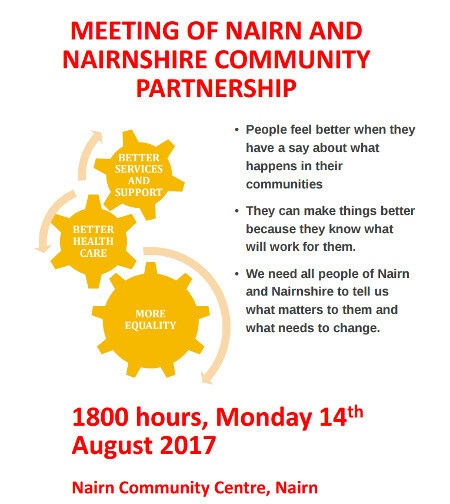 Meantime, we will be at the Nairn Show (29/08/217) at the Scottish Fire and Rescue stand between 1100 hours and 1230 hours, why not take a wander past and tell us what's important to you in Nairn and Nairnshire."